Milly and I read lots of retellings of the Russian fairy tale Firebird prior to seeing the Center Dance Company's performance of the ballet this afternoon. You might want to put on some Stravinsky and read them, too. 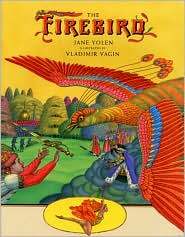 Best before the ballet: The Firebird by Jane Yolen; illustrated by Vladimir Vagin (Harper Children's, 2002). Yolen's retelling follows the Balanchine ballet, so if you see a performance inspired by Fokine (as we did), you might be surprised by the business with the magical egg. I really like the way Vagin illustrated the story at the top of the page and its performance on stage across the bottom. N.b., Jane Yolen trained at Balanchine's School of American Ballet. Lovely to look at: The Tale of the Firebird by Gennady Spirin; translated by Tatiana Popova (Philomel, 2002). So the Firebird looks like a peacock: Spirin's illustrations, full-page watercolors and delicate, detailed borders, are exquisite. This is an original version of the Firebird story adapted from three Russian fairy tales and features a gorgeous gray wolf and our old friend Baba Yaga as well as Koshchei and, of course, the Firebird herself. Milly's favorite. 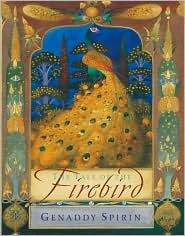 The Firebird by Demi (Henry Holt, 1994). 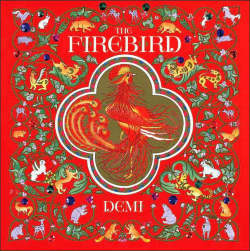 If you like Demi (and we do), you'll love her Firebird. It's all red and gold and there are little animals everywhere. The art doesn't feel Russian to me, but the text is based on Ransome's translation of Afanasiev, and it reads aloud nicely. The paperback edition of this book was for sale at today's performance; we didn't buy it, but Milly did get to bring home one of the Firebird's red feathers [thanks, Brenda! ].